Konrad Lorenz won the Nobel Prize in Physiology and Medicine in 1973 for his experiments with animal behavior. Lorenz discovered the principle of imprinting, where a bond is formed between a new born animal and a caregiver. This is the mechanism where an auditory or visual stimulus is used to induce the young to follow its parents. In industry, automated guided vehicles (AGVs) use environmental stimuli to follow a specific route. Here, Jonathan Wilkins, marketing director of obsolete industrial parts supplier, EU Automation, discusses how automated guided vehicles have advanced from simple materials handlers to intelligent autonomous robots. Automated guided vehicles are mobile robots that follow markers or signals during navigation. The first AGV was introduced in the 1950s by Barrett Electronics, and performed a simple towing action, with its position guided by a wire in the floor. Since the 1950s, the market has rapidly increased and AGVs are used across numerous industry sectors. Automated guided vehicles are predominantly used for materials handling purposes. 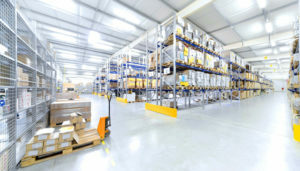 This can include a range of tasks from on time delivery of parts to the production line, to round the clock transit. If the vehicle is equipped with a clamping mechanism, positioning fixtures and tool attachments, it can perform a range of functions. 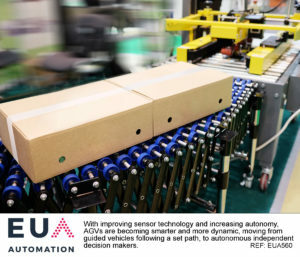 AGVs can be equipped with sensors for traceability, so that the plant manager can monitor the position of each individual vehicle and therefore track the movement of materials around a facility. Pick-up, transit and delivery of items can be time stamped as part of this process to further improve tracking. This information can be integrated into the company’s enterprise resource planning (ERP) or materials resource planning (MRP) systems. The earliest AGVs were guided around the factory by a wired method. To navigate in this way, a wire is embedded into a slot in the floor, and transmits a radio signal, which can be detected by a sensor on the AGV. The AGV is then guided around the facility following the wire. Though this navigation technique is still used today, there are a variety of other methods for plant managers to choose from. Some AGVs use guide tape that is either magnetic or colored to navigate. Sensors on the AGVs detect the tape and this is used to guide the vehicle. Guide tape is also used in laser target navigation, where reflective tape is mounted on walls, poles or machines and the AGV calculates distance using a laser transmitter and receiver. This has an advantage over the wired method, because it is easier to change the route of the vehicle as the process of relocating the tape is more straightforward. In inertial navigation, reference points are embedded into the factory floor at x,y coordinates. The AGV uses information from a sensor, a gyroscope and a wheel encoder to determine location. Changes can be made to the pathway by simply altering the reference points, making this method more flexible. However, some change to factory infrastructure is still required, and the vehicle cannot make independent route planning decisions. The next step from inertial navigation is open path navigation – this means the vehicle can move independently from one place to another, moving from a guided vehicle to a self-driving vehicle. This new breed of vehicle can overcome one of the key problems for AGVS – encountering something unexpected. In a changing environment, a self-driving vehicle may be a better fit. This type of vehicle operates independently from a driver or a fixed pre-programmed input directly controlling the steering, acceleration or braking. Laser-based perception and navigation algorithms can be used to dynamically navigate around a factory. Self-driving vehicles can use an on-board computer and increased numbers of sensors to complete more complex tasks, including decision making. Independent and intelligent navigation methods can even mean the plant manager does not need to modify factory environment or infrastructure. One such navigation technique is natural feature guidance, where the vehicle can record and store images and calculate its position in relation to existing features. The vehicles can also use vision-based guidance systems, using cameras to act as eyes. An additional benefit of this is that plant managers gain a 3D virtual view into the environment the equipment is operating in. This means if the AGV does come across anything unplanned or unusual, the operator can easily find the explanation and correct it. As more factories are upgraded and new facilities are built, advancing AGVs will prove to be a core component of the smart factory. With improving sensor technology and increasing autonomy, AGVs are becoming smarter and more dynamic, moving from guided vehicles following a set path, to autonomous independent decision makers – much like Konrad’s animals will as they grow.